If you think about FOI as a children’s colouring book (just go with me on this), the lines were drawn by the legislation. The decisions of the Information Commissioner, Information Tribunals, and the courts add the colour, taking great care not to go over the lines. 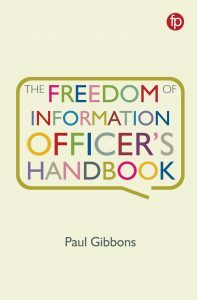 FOI Officers are not lawyers (in the main), but if we’re to be effective, we need to keep an eye on these decisions. 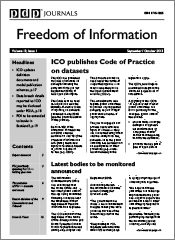 Sometimes they can be very interesting, especially if you’re an FOI geek like me. For those who aren’t familiar with the FOI appeal process, here’s a brief précis. If a public body refuses your request, you can ask it for an internal review of the decision. If they still refuse, you can appeal to the Information Commissioner. At that point, the Commissioner can either uphold the authority’s decision, in which case, you can appeal to the Lower Tier of the Information Tribunal, or he can instruct the authority to disclose the information, in which case, they might appeal to the Tribunal. Further appeal can then be made to the Upper Tier Tribunal (you used to go to the High Court on points of law at this stage), and if there are still points of law at stake, you or the authority concerned can appeal to the Court of Appeal. And then to the Supreme Court. Let’s not go any further or the Daily Mail may get excited. 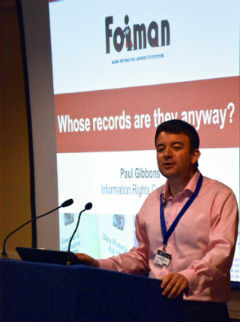 Last week I was fortunate enough to attend a free seminar given by 11KBW (whose blog on information rights law, Panopticon, is well worth a look) on latest developments in information law. One of the barristers speaking, Robin Hopkins, explained the implications of a decision made by the Upper Tier of the Tribunal, and I sat up sharply in my seat. The decision related to requests submitted to the Department for the Environment, Food and Rural Affairs (DEFRA) and the Home Office. I’ve been thinking about it ever since, and sad as it may seem, I spent some of my Sunday afternoon reading the full decision. The Upper Tier Tribunal was looking at an issue that has troubled a few sittings of the Tribunal. When a public authority refuses to provide information, it must write to the applicant and explain which exemptions apply and how it has reached that decision. But what happens if the applicant appeals to the Commissioner, or even the Tribunal? Can the authority suddenly decide that another exemption, not already relied upon, is relevant? Previous Tribunal decisions have suggested that it is entirely at the discretion of the Commissioner or the Tribunal to decide on this. The only way that an authority could guarantee that an exemption would be taken into account would be if it had included it in its response to the applicant. In other words, “use it or lose it”, which explains why many authorities throw everything including the kitchen sink at requests for particularly sensitive information. The new Upper Tribunal decision from Judge Jacobs takes a new line. He ruled that authorities have the right to introduce new exemptions at a later stage. This would mean that the Commissioner and the Tribunal have to consider exemptions (or exceptions under EIR) raised late in the day by authorities. This sounds at first hearing to be a bit lenient on public authorities, and I can understand (and so could Judge Jacobs to be fair) why it won’t go down well with some observers. But I also think that it’s the right approach. Let me illustrate this through a hypothetical situation. Somebody has requested details of a meeting between the police and a government body about knife crime. One of the attendees was a family member of a victim of knife crime, there to describe their experience. It was a traumatic and difficult experience for them, but they agreed to take part on the understanding that their involvement wouldn’t be known outside the meeting. The authority refuses the request on grounds of s.31 (law enforcement), but when it gets to the Commissioner, he rules that while the exemption applies, the public interest is in favour of disclosure. The authority then realises that it should also have claimed s.40 (personal information) and/or s.41 (information provided in confidence) in respect of the details of the member of the public who had had such a traumatic experience. Does the Commissioner rule that the details of that person should be disclosed, purely because the authority had failed to raise the need for the exemption in their original response? Of course not, and in fairness to the Commissioner, it is likely he would have used his discretion to allow the use of the exemption in this situation. But Judge Jacobs argues that it is only by analysis of individual circumstances that it will be possible to identify whether exemptions should be allowed. If the Commissioner or Tribunal used their discretion not to allow late use of exemptions, they might not give sufficient consideration to important issues affecting third parties. In other words, the Commissioner also has a duty to identify exemptions that might apply that the authority has missed. This again, makes sense, however unpalatable it may be for the Commissioner’s Office. Surely they have to ensure that their decisions don’t cause harm (or prejudice, to use the legal jargon), and that has to mean looking beyond just what the public authority may have argued. After all, shouldn’t the Commissioner’s staff be better informed than most on the application of exemptions? I can’t say whether the information requested in these cases should have been disclosed or not (that wasn’t looked at in the ruling). But I do think that Judge Jacobs got it right on this important, if technical, point. I can’t imagine that I’m the only FOI Officer who will appreciate this recognition of the realities of how FOI works in our organisations. Nobody’s perfect, and third parties certainly shouldn’t have their rights infringed just because of that eternal truth. I think that’s the right approach as it creates proper incentives for the public authority to get things right first time, but doesn’t hurt others when they don’t. Shame the Upper Tribunal doesn’t agree 🙁 The only other comeback against an authority that repeatedly screws up is if the ICO decides to issue a Practice Reccomendation or Enforcement Notice, and those are extremely rare. I wish I’d had a proper chance to read the judgment before last week’s seminar. This is, on any analysis, a problematic decision. It risks placing the ICO in a role where he effectively is the main decision-maker, and not the authority. While the judge largely dismissed concerns that “cavalier” authorities might take advantage of a non-discretionary approach by the ICO to late exemptions, I think he was too quick to do so. Given the lack of effective sanctions under the Act against “cavalier” authorities, it is not inconceivable (particularly in current economic circumstances) that some authorities will adopt blanket refusals to disclose and allow the ICO to do the spade work. I need to give this some close thought. In the first instance, I would be very interested to know if this decision is being appealed. Does anyone know? I’d like to comment on the title of this post “If you don’t use it, you won’t lose it”. What if you’ve already lost it, personally? Two people have lost it, in both Cheshire West and Chester, and Brent. What have they lost? Their future ability to make FOI / DPA requests to their local councils. I’ll qualify that slightly and say they are most likely not sure if they’ve actually lost that right, but these councils have attempted to restrict or remove their ability to make requests as part of their compromise agreements. The recipients will most likely be feeling intimidated and effectively ‘gagged’. Sorry if this is off-thread, but I believe it’s an important issue that needs to be out there. These two instances of eroding people’s statutory rights were both effectively concealed in an area which is already wrapped in secrecy. Neither signatory party to a compromise agreement is permitted to speak publicly about the details or even the existence of such an agreement. They can only speak to their professional advisers or to their union reps – who are bound by confidentiality.